An Unwilling Alliance is the new book, due out in April 2018 and tells the story of Captain Hugh Kelly RN who returns to the Isle of Man after fifteen years away with a few months leave and a small fortune in prize money to find himself a sensible Manx wife. Roseen Crellin is twenty-one and determined to resist her father’s efforts to find her a husband. Still dreaming of the young English soldier who sailed away and broke her heart, she has no intention of encouraging Captain Kelly’s courtship and certainly no intention of developing a liking for the man. Major Paul van Daan is newly promoted and just back from Ireland, sailing with his battalion to Copenhagen under the command of Sir Arthur Wellesley. Paul’s courage and talent are unquestionable but his ability to manage the minefield of army politics has some way to go, and in a joint operation with the navy there are many ways for a man of Paul’s temperament to get things wrong. Hugh joins Admiral Gambier’s fleet, trying to forget the girl he left behind him while Roseen’s unhappiness leads to a rash escapade that risks both her reputation and her life. 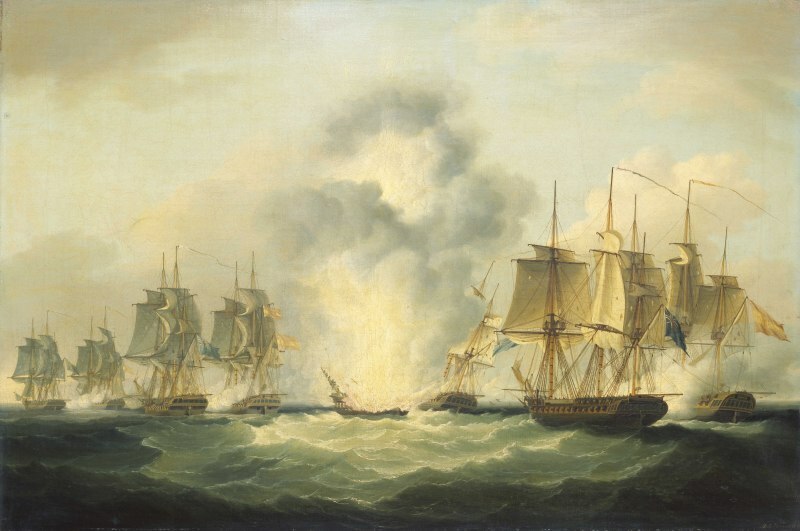 As Britain hovers on the brink of war with neutral Denmark and the diplomats and politicians negotiate to keep the Danish fleet out of Bonaparte’s hands, a more personal drama plays out on the decks of the Royal Navy and in the lines of Lord Cathcart’s army as an impulsive action puts Paul’s future in the army at risk. Hugh Kelly finds himself torn between his duty to the service and a reluctant admiration for the young army officer willing to gamble his career on an act of charity. St Michael’s Isle was the northern most point of the Langness Peninsula. Roseen remembered her father telling her that it used to be detached at high tide, a true island, but the causeway had been built in the middle of the previous century to link it permanently. It was formed of rocky slate, it’s acidic soil limiting the plants that could grow there, and it was inhabited now mainly by sea birds of all kinds, wheeling overhead with their hoarse cries and occasionally swooping down into the choppy sea which crashed onto the rocky shores of the island. It was a place of peace and great beauty but it was not quiet. 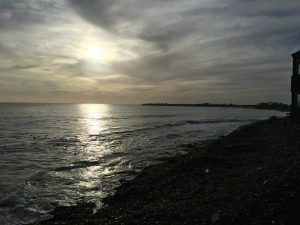 Roseen had grown up loving the sound of the sea and had always longed to live close enough to it to hear it through her open bedroom window at night. They dismounted and Hugh led both horses to the old chapel and tethered them to a rusty iron gate which had been put up to prevent people going into the chapel which was disused, roofless and probably dangerous. He turned back to Roseen and held out his hand and she smiled and took it. She was becoming accustomed to Captain Kelly’s assumption that she could not make her own way across rough ground, or indeed, up a flight of stairs, without his assistance. Privately, Roseen suspected his chivalry was an excuse to hold her hand, but she had no intention of asking him. He was likely to tell her the truth. He was also likely to stop doing it if he thought it annoyed her, and Roseen realised with some surprise that she did not want him to. There were two buildings on the island. 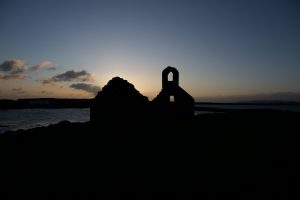 The tiny ruined chapel dated back to Celtic and Norse times and had long been abandoned, home now only to nesting birds and rabbits. The second was a circular fort, built originally under Henry VIII as part of a major coastal defensive system. It had a wall walk at the top and supported eight cannons. It had fallen into disuse for many years but was re-fortified in 1640 by James, 7th Earl of Derby, a strong royalist, against the ships of Oliver Cromwell during the English Civil War. The fort was renamed Derby Fort and the Earl’s initials along with a date of 1645 could still be seen engraved above the fort door. Hugh paused to look at them and Roseen came to stand beside him. “It’s small but it looks very solid,” she said. She broke off realising what she had just said. Hugh did not respond immediately. He was looking out to sea at a small fleet of boats outlined against the bright sky in the distance and Roseen wondered if he had heard her and sought frantically for a change of subject. After a moment he looked round and smiled. A voice startled both of them, a hail from the ramparts of the fort. A figure in a red coat was visible, musket in hands, looking down at them. “Who goes there, sir?” he called. There was little to see inside. Most of the stone flags had long gone or were broken and grass had taken their place. There were the remains of a free standing building, too damaged to guess it’s original purpose, although the sergeant and six soldiers of the fencibles had turned it into a makeshift camp site with a small fire lit. Roseen imagined this was not a popular duty but the men seemed to have made the best of it. Two of them manned the battlements while the others rose and saluted Hugh with commendable speed as he approached. It was odd to see him accepting and returning the salute as his due. It was not how Roseen saw him and she wondered suddenly how different he was aboard his ship with hundreds of men under his command. In recesses in the wall to the north and north-west, six cannons covered the entrance to the bay and Roseen listened with some amusement to Hugh’s questions about the guns, their origin, their age and their maintenance. The sergeant answered as best he could but it was very clear that Hugh knew a good deal more than he did about the guns. They inspected the lighthouse placement which was probably the most useful aspect of the fort, and when their visit was ended she saw Hugh speaking quietly to the sergeant, before slipping him what was clearly a vail. The smartness of the sergeant’s salute suggested that it was a generous one. Riding back towards Castletown and then on to Malew and the Top House for dinner, Hugh was quiet and Roseen thought about that and realised that she was very comfortable with his silence. She studied him as they rode and wondered what he was thinking about. “What are the usual guns on a ship like the Iris?” Roseen asked, cutting off his apology. She had never really thought much about naval gunnery but she liked hearing Hugh talk about his profession. He did so rarely but it was different to the posturing of the young army officers she had met. There was genuine enthusiasm in his voice when he talked about the Iris which lent interest to the subject.